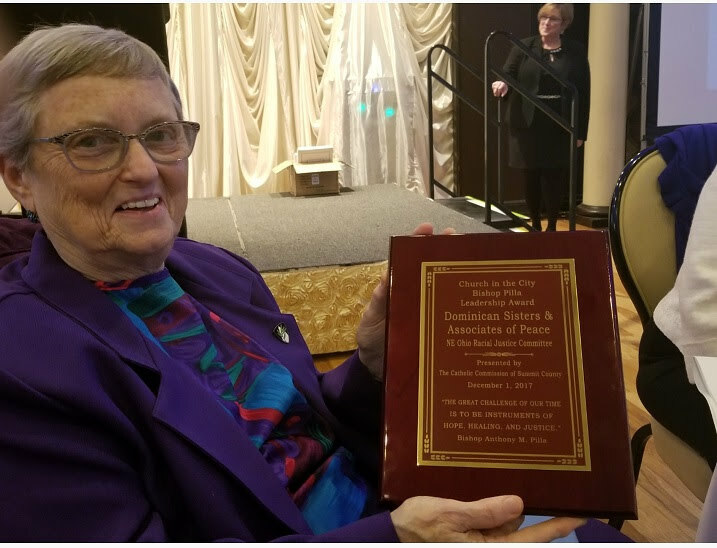 Sister Valerie Shaul, OP, displays the Bishop Anthony M. Pilla Leadership Award. 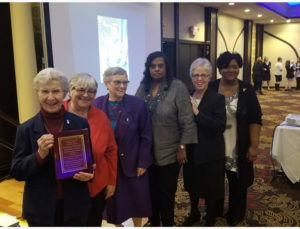 The Racial Justice Committee of the Dominican Sisters of Peace and Associates in Northeast Ohio was awarded the Bishop Anthony M. Pilla Leadership Award by the Catholic Commission of Summit County at the 39th Annual Bishop Cosgrove Justice Dinner and Silent Auction on Friday, December 1 in Akron, OH. The Racial Justice Committee was recognized for their ongoing efforts to build community and encourage prayer by hosting a series of talks called “Building Racial Harmony.” Held at the Akron Motherhouse, these bi-monthly events focus on issues surrounding racism and the effects of racism on the community. The Committee includes Dominican Sisters, lay Associates of the Congregation, and staff members from the Akron Motherhouse. According to Co-director of Associates Colette Parker, OPA, “The Racial Justice Committee has two goals – to host civil, educational conversations and to be a center for community prayer.” To that end, the Racial Justice Committee has organized and planned events at the Dominican Sisters of Peace Akron Motherhouse that include speakers, panel discussions, and prayer services. Dominican Sisters of Peace Racial Justice Committee Members attend the 39th Annual Bishop Cosgrove Justice Dinner and Silent Auction. Left to right: Barbara Catalano, OP; Pat Schnee, OPA; Valerie Shaul, OP; Celeste Williams, Dominican Sisters of Peace Staff; Cathy Arnold, OP, and Colette Parker, OPA. The Bishop Anthony M. Pilla Leadership Award is named for the bishop emeritus of the Catholic Diocese of Cleveland and is awarded to groups or individuals who demonstrate solidarity with vulnerable or marginalized populations and a commitment to ongoing education, advocacy, and community involvement throughout Summit County. Other honorees included: The Bishop William Cosgrove Justice Award, given to the Seeds of Change Tutoring program; The Bishop Anthony M. Pilla Leadership Award, given to Brooke Roberts, co-founder and executive director of The Ite Project in Akron, and The Rose Juriga Memorial Youth Justice Award, awarded to John Labosky, a senior at Tallmadge High School, who among other things is involved with the S.O.A.P project (Save Our Adolescents from Prostitution) with the Dominican Sisters of Peace. As we enter into Holy Week, we reflect on the Stations of the Cross with artwork by Father Marie-Alain Couturier, OP. Like splendid palm branches, we are strewn in the Lord’s path.